A waterfall basin 'Niko-buchi' belongs to the branch of Niyodo River whose water quality is the most beautiful in Japan. 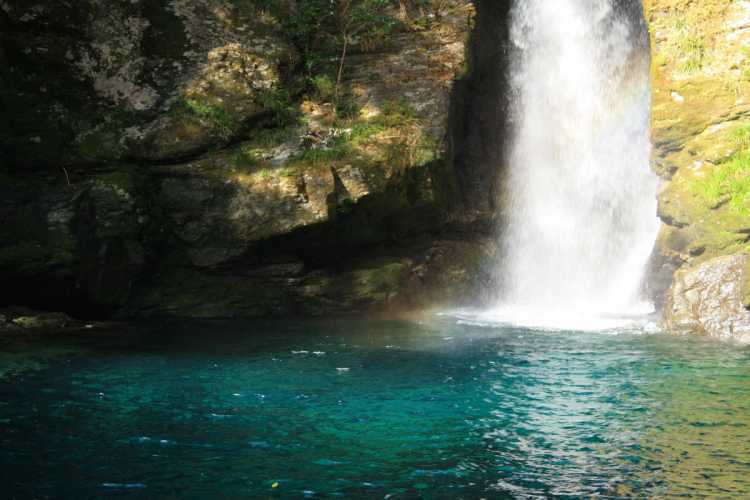 The very clear water like emerald is called Niyodo Blue, and here is a popular place to see it. Though the path is severe, you can meet the mysterious scenery!◎You can find a signboard on the way to 'Green Park Hodono'. To the waterfall basin, you need to hold the chain for about 4 meters. The most beautiful time is when the sun stays right above. Niyodo River running in Kochi has won the first prize of the clearest water in Japan many times. For the blueness of water, it's called 'Niyodo blue' in recent years and 'Niko pool' is a representative spot of Niyodo blue.